99 BLAEU, G. Novus XVII Inferioris Germaniae Provinciarum Typus. Amsterdam, 1643-1650. Beau col. d'�poque. Fente en bas du pli central et d�chirure dans la carte (12 cm) renforc�es. Tampon de marchand au verso. - Split along centre fold and tear (12 cm into the map) re-inforced. Dealer stamp on verso. In original colour. 400 x 503 mm. 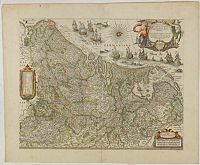 Willem Blaeu published this map in 1608 as a wall map with figured borders. When later, in 1630 he needed a general map of the Netherlands for his first atlas, the Appendix, the decoration in the borders was sacrificed: the borders of the copper plates were cut off. One of the most decorative maps of present Netherlands, Belgium and Luxembourg.